Contemporary Artists Claire Coté and Anna Keleher are to spend 40 days and 40 nights of action research and experiment above and below ground at Marble Arch Caves Geopark this summer. They will be meeting the people, places and things of these ancestral homelands between 3rd June and 12th July 2011. Supported by Marble Arch Caves Geopark and funded by National Lottery through Arts Council England this project seeks to enrich relationships with natural, social and cultural ecologies. Anna and Claire’s successful international collaborative partnership began at Dartington College of Art in 2007 when they both enrolled on the innovative M.A Arts and Ecology course at Dartington College of Arts. When Claire finished her studies and had to return home to her native New Mexico they vowed they would meet up again but this time in Ireland where they would further research prehistoric ecologies. Anna who is based in the English Riviera Geopark collaborates with European Geoparks. She has recently completed a micro residency at “London Field works” tree house observatory Outlandia in Glen Nevis, Lochaber Geopark, Scotland. Together these innovative artists will explore the natural and cultural heritage of Marble Arch Caves Geopark investigating Dúlra – nature/ecosystem; Dhúchas – heritage/mother country; Aisling – dream/vision. “We are devising a special tool-kit of adventurous processes, novel techniques and gentle interactions to gather data from the borders of the unknown” says Anna Keleher about their upcoming residency. 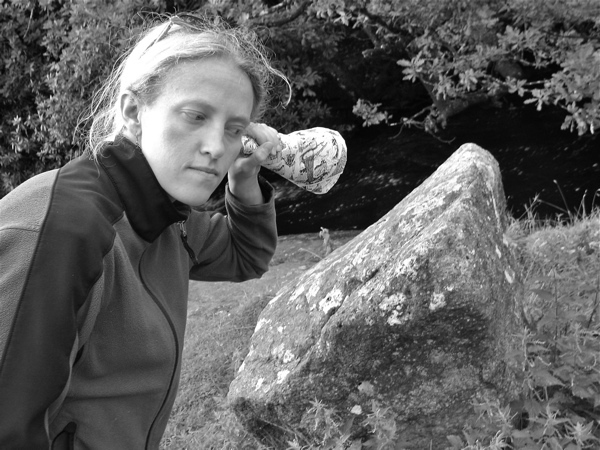 Anna and Claire make audio journeys, radio broadcasts, drawings, sculptural installations and performative events. The outcomes from the DREAMING PLACE Marble Arch Caves Geopark residency will be shared with diverse communities, both local and international through their blog, live events and exhibitions. See site for details: http://www.dreamingplace.eu. Claire and Anna are creating ways for locals and visitors to participate in the residency and its artistic outcomes. Participate in their DREAMING PLACE postcard project, meet them on a crag or drop by their weekly storyblog to influence how they engage with this x- border Geopark. “DREAMING PLACE is about deepening and illuminating our relationship with Place. If you grew up in the Geopark or you live, work, play or like to visit there, we’d like to hear from you!” says Claire Coté.